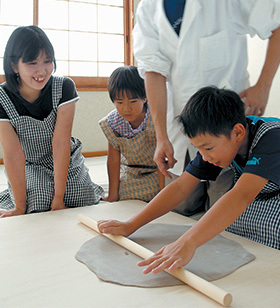 Why not experience the 300 year old tradition of making Izushi Soba Noodles? One of our skilled craftsmen will carefully guide you through the 300 year old process of creating Izushi Soba Noodles. You will also get to eat the soba noodles you have made. Izushi Soba fans, by all means, please join us for this soba experience. We accept reservations for 2 people and more. *Groups of 10 or more, please make a booking at least 4 days in advance. *Should there be members of a group who don’t participate, a special meal will be prepared for them. *Because sharp utensils are used, children under the age of 4 years and those under the influence of alcohol will not be permitted. *Depending on the date and time, we may not be able to accommodate all bookings.